Peel and devein the shrimps, place them in a container and stir in the olive oil and garlic. Set this in the refrigerator for a couple hours. Stir with two wok spoons for one minute. Use all your senses when cooking. Now you should notice the raw shrimp aroma – that will come in handy later. Continue to wok, stirring slowly until the shrimps change in appearance from translucent to opaque white or pink and curl up into the pretty circular shapes as seen in the photo. 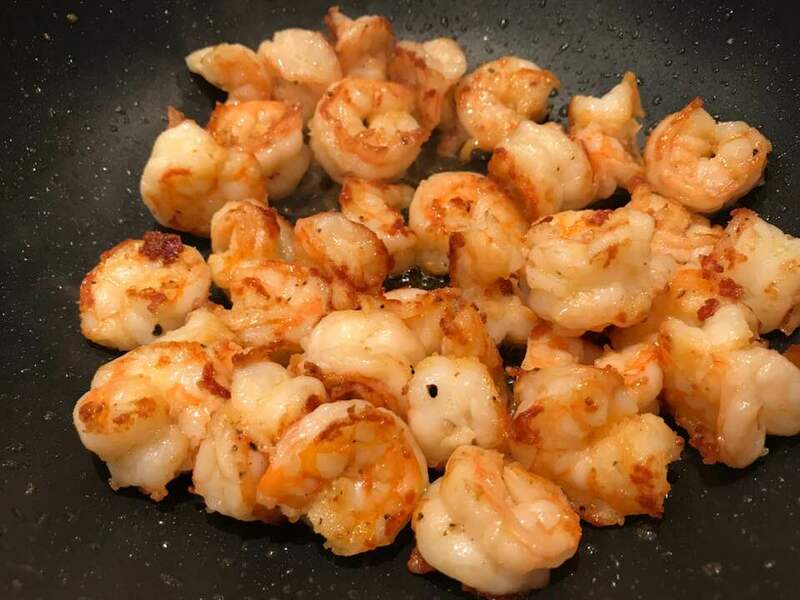 Once they curl up, spread the shrimp out into an even layer in the wok and wait 20-30 seconds. This lets the shrimp stay in contact with the pan just long enough that it will take on pretty browned bits. Then stir and repeat until they brown a bit. Check the aroma. The raw fragrence should be gone and by the time the shrimp looks like the photo, they will be done and still juicy. Precisely how long this takes will depend upon how hot your wok was when you poured the shrimp in and how big your shrimps were. You will wok anywhere from 6-10 minutes. If you did not trust me about starting on high and instead set the wok on medium high and if your shrimps were very big, it may take a few minutes longer. With practice you can trust your nose and the appearance of the shrimps. For those that are hesitant to be so trusting, cut one open if you like to make sure it’s white throughout. Do take care to not overcook the shrimps so they do not dry out. This entry was posted in Main Dish, Seafood and tagged delicious, quick, shrimp, Wok. Bookmark the permalink. You’ll never need another pan sauteed shrimp recipe again. I’ve ditched my complex spice rubs and garlicky lime soaks technique for this. Simple, delicious and versatile. Serve over pasta, in tacos, or on the side of a surf and turf. Even as an appetizer, but nobody will even reach for the cocktail sauce these are too good!